When water is heated at atmospheric pressure, its temperature rises until it reaches 212°F (100°C), the highest temperature at which water can exist at this pressure. Additional heat does not raise the temperature, but converts the water to steam. This ‘phase change’ requires a tremendous amount of additional energy input. The ability of steam to carry large amounts of thermal energy is the property that makes it so desirable as a working fluid. The ‘Latent Heat of Vaporization’ demonstrates why steam is able to carry so much thermal energy. 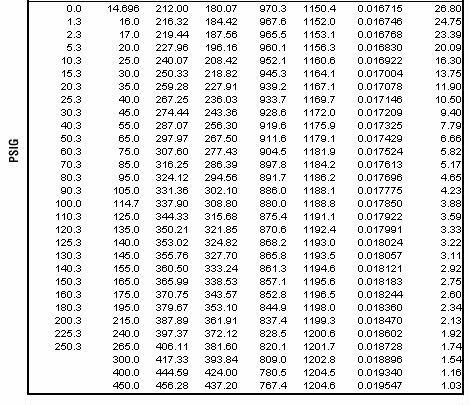 Water heated from 32F to 212F contains 180 BTUs (212F – 32F) per pound. 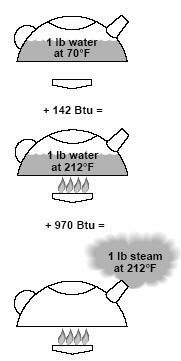 To go from 212F water to low pressure steam requires another 970 BTUs per pound. Increasing the pressure increases the temperature of the phase change, and increases the amount of energy the water/steam can carry. Enthalpy is the amount of heat available from any medium in its current state. For steam, the enthalpy of the vapor is the same as the total heat of the steam. This is the sum of the enthalpy of the liquid (heat of the saturated liquid) and the enthalpy of vaporization (latent heat). 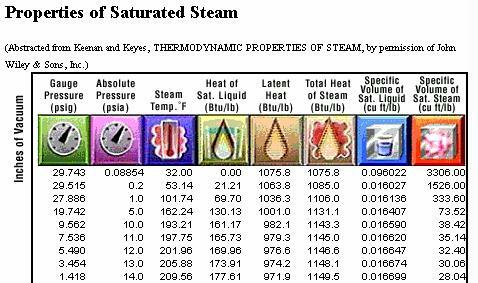 See the Steam Table below and look in the column labeled ‘Total Heat of Steam’. This is approximately equal to 970 BTUs Latent Heat of Vaporization, plus the sensible heat BTUs, which is a function of pressure. Most industrial steam systems are closed systems. When water vaporizes to become steam in the boiler, the expansion pressurizes the system. Steam is forced out of the boiler by its own pressure and is carried by piping to whatever devices are to be employed for heating or processing. The pressure changes within the system provide transportation for the steam and also affect its physical properties. It is convenient and helpful to think of the typical steam system as a loop with four distinct sections. The first is Generation. During this stage – in the boiler – heat is applied to water to raise its temperature. After the water has vaporized, the resulting steam moves into the second stage of the steam loop: Distribution. This is simply the movement of the steam within a closed system to its point of use. The use, whatever that happens to be, is called Heat Transfer. This is the third stage. In the heat transfer portion of the steam loop, the heat of the steam is, well, transferred. In other words, it is put to work doing countless jobs. As the steam gives up its heat through heat transfer or use, it condenses or changes its state – this time from a gas back into a liquid. This is called condensate. It is very important to drain condensate from a steam system as quickly as possible. This is the job of a simple device called a steam trap. The fourth and final section of the steam loop is Condensate Return. For many years, condensate was simply dumped on the ground or into a drain. In recent times, cost pressures and environmental concerns have forced energy managers to rethink how they handle condensate. For more information, link to Armstrong International’s web site and enroll in the Steam University (Link Below).